If you would like to join mid session, please contact lorraine@mummybootcamp.ie or call 086 3836020 and we will get you started. All our Mummy Bootcamp classes include a mat and dynaband work, so all Bootcampers are expected to have them at each class. We are currently out of stock of the mats, but you can purchase a dynaband from us here if you need one. You can do so here for €10. 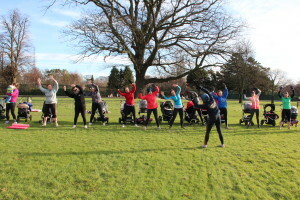 Phoenix Park - Google Maps: This popular Mummy N Buggy Bootcamp in Phoenix park is fun, social and effective outdoor exercise classes with experienced and quality instructors for new Mums & Babies. We Meet at the Polo Grounds near Dublin Zoo. Allow yourself time to find it on time. St. Enda's Park - Google Maps: St Endas is home to our original Mummy N Buggy Bootcamp! For all our classes here we meet at the car park on Sarah Curran Ave. It's important to be there at least 5-10 minutes before the start time as we will be using different parts of the park for every class. Cabinteely Park - Google Maps: Cabinteely is one of our recent hot spots and we love it! With plenty of open space, this lovely green area is the perfect spot for a good workout! Nothing like sweating a bucket next to the elegant grandeur of the Big House! We meet in the park, in front of the main house. St. Anne's Park - Google Maps: Directions: Coming out of town go down the coast road past Clontarf. Turn left up Mount Prospect Avenue (there is a group of shops on the corner including Wongs Chinese Restaurant; it's the left just past here.) Continue up the road about 300-400 metres and enter the Park on the right hand side. Follow the footpath into the park. Head up the path to the right and you will come to the meeting point. Please be there at least 5 minutes before your class. Bushy Park - Google Maps: We meet just by the band stand in Bushy park. As you enter by the new paddle courts, just follow the path all the down towards the pond down the hill, and you will see us by the bandstand. €99 FOR 6 WEEKS - Go to any location during your 6 weeks! This unique class is a great outlet for new mums as you can bring your baby and buggy along, which is a great attraction as there is no need for a sitter! It gives Mums the chance to get in shape and pull back into that body that you had before it was all about baby. Mum's get to meet up with other mums, swap stories, trade tips; it will get you outdoors, so you can get fit and active, feel energetic and positive and most of all, help you lose the weight and tone up. We also set up private groups online to chat to other mums in your class and give notifications and useful snippits of info throughout your 6 weeks. All our Mummy Bootcamp sessions run for 6 weeks, and are twice a week with a 3rd class on Saturdays which are free to 6 week Mummy Bootcampers to attend. However ALL MUMS ARE FREE TO ATTEND ANY OF OUR MUMMY BOOTCAMP CLASSES IN ANY LOCATION THROUGHOUT YOUR 6 WEEK MEMBERSHIP! The Saturday sessions are in Bushy park at 9AM, Phoenix park at 10:30 and Herbert park at 10:30, and are buggy free sessions! See above for locations and start dates. Visit www.bootcampireland.com for Saturday locations. Bushy park (down by the band stand), Phoenix park (up the 15 acres pitches by the magazine fort), Herbert park (by the black railings, on the side of the park opposite the playground/tennis courts). If you would like to join mid session, please contact lorraine@mummybootcamp.ie or call 086 3836020 and we will get you started.